Most newspapers’ future probably is not daily. When a newspaper cuts its frequency, I hope it is not just cutting back, but making the right steps to build a digital future. Let’s start with Katrina. The performance of the Times-Picayune staff (and the Sun-Herald staff in Biloxi, Miss.) 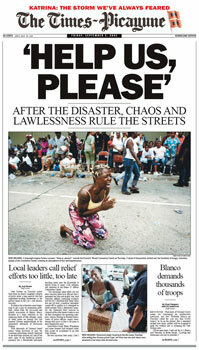 during and after Hurricane Katrina stands out as one of the most heroic examples of journalism during my career. It ranks with the Washington Post’s Watergate coverage, the New York Times 9/11 coverage, the Grand Forks Herald’s coverage of the 1997 flood and fire, and all the best war correspondence. Whatever the future holds for the Times-Picayune, Editor Jim Amoss and his staff provided an example for all of journalism in their breaking news coverage, their resiliency and their public service. When the upheaval sweeping the news business affects such heroes, we all feel a deeper, more powerful connection. In my case, the connection feels personal. 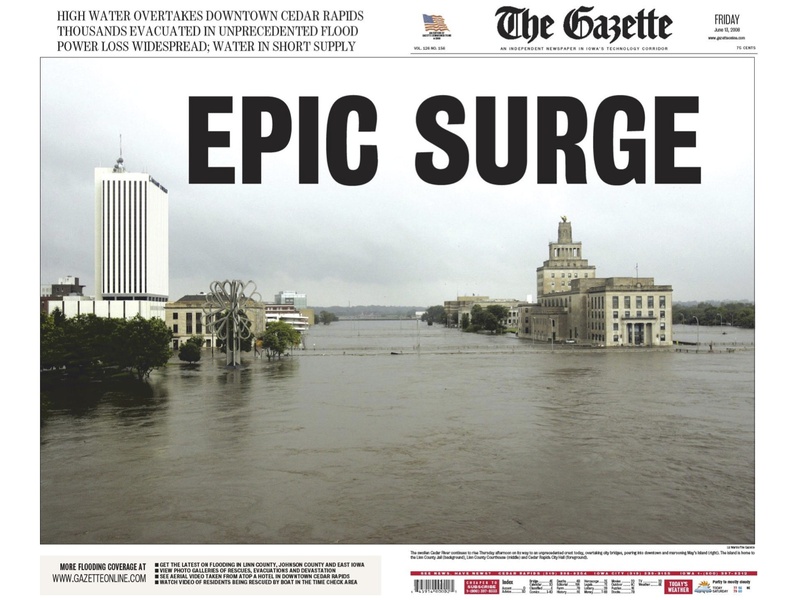 On my third day as editor of The Gazette, Cedar Rapids experienced our own historic flood. In the ways that people like to use measuring sticks and fall back on clichés, every natural disaster is compared to Katrina. I was careful about making those comparisons in the first day or two of the flood. As catastrophic as the floods were to our community and region, deaths fortunately were rare, and hundreds died in Katrina. But I embraced one comparison and shared it immediately with the staff. I believe it was the only time I ever stood on a desk (a file cabinet, really, it looked sturdier than the desks) to make an announcement as editor. Dan Shea, managing editor of the Times-Picayune, had emailed me, saying how familiar the pictures of our flood looked to him and his staff. They were following our coverage closely and sent along their admiration and encouragement. I had simply forwarded other emails of praise to the staff, but this one deserved a special announcement because of the exalted place the Times-Picayune holds in journalism. Heroism, compassion and generosity do not protect the Times-Picayune from the economic catastrophe the news business is experiencing. But as they face that challenge, I want to thank them again for the inspiration and example they provided to all of journalism in 2005 and for the encouragement and support they provided to the Gazette staff in 2008. Whether Advance is making the right moves this week or not, I give it credit for its considerable commitment to New Orleans during and after the disaster. I don’t know what the costs were, but news coverage, printing and distribution following Katrina were huge expenses, and businesses that have been destroyed don’t advertise. The knee-jerk reaction when a company cuts jobs is to criticize it as money-grubbing and cold-hearted, caring only about the bottom line. Others have had that reaction, and I don’t know enough to agree with them or refute them. I will lament the loss of these journalists’ jobs (and the other jobs cut in recent years) without finding fault. Here’s what I hope: I hope that Advance, which already cut back its print frequency to three days in Michigan and is doing the same thing in Alabama, is helping to develop a healthy business model for newspapers. Newspapers’ print advertising revenue nationally has collapsed by 62 percent in the past six years, costing thousands of journalists their jobs. That decline is continuing this year and shows no sign of ever reversing. Newspapers need dramatic action if they are going to stay in business. I think the Digital First approach is the path to the future. But we have to develop a healthier print model, at least until we build a strong enough digital business to support a community news organization. It’s frequent enough to be a habit and fresh enough to be timely, if done right. Breaking the daily print production cycle will help (and force) newsrooms to develop more efficient digital-first workflows. Dropping the daily print product will help (and force) newspapers to develop print products that are more forward-looking, analytical and investigative. Publishing three days a week will allow newspapers to still reap most of the print advertising dollars they still do at considerably less cost. Without a daily print product, sales departments will better be able to develop digital products and strategies to support a healthy future. I worry that cutting one-third of the Times-Picayune’s remaining 150 newsroom jobs (it was 265 before Katrina) will too severely impair its ability to generate the local news coverage it will need to succeed on both platforms. 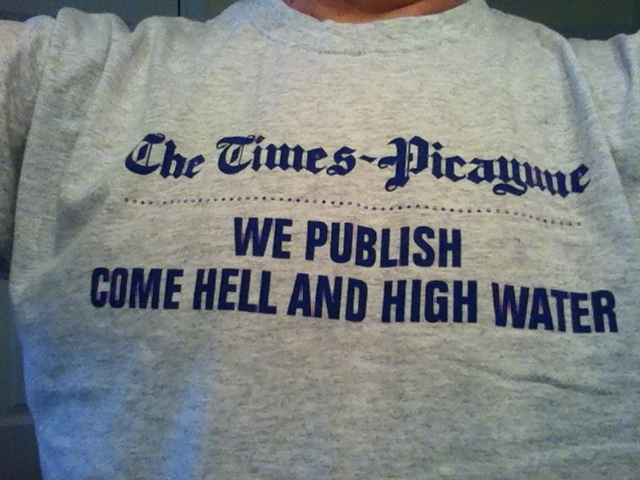 Still, I hope the Times-Picayune’s move this week is a step toward a healthy future based on strong print and digital products. Maybe they can again provide an example for others in the news business in a time of disaster. You probably already have read a considerable amount about the Times-Picayune’s decision. If not, you can get a range of news and views from these pieces by Ken Doctor (I got the job-loss numbers above from Ken’s piece), John McQuaid, Jeff Jarvis, David Carr (who broke the story), Charles Apple, Jim Romenesko, Sascha Segan, Steve Myers and Andrew Beaujon. Alas, my tenure at the Gazette was much shorter. Great piece from the heart.